Whenever I have a lot of lemons in my kitchen, I usually make a fresh batch of lemon curd. I am a big fan of the creamy, tangy curd and will put it on fresh fruit, scones, slices of cake and just about anything else I can think of. Another great use for it is putting it into a batch of ice cream. 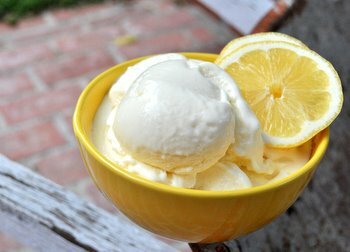 With the zesty lemon curd as a base, you get a very bright and fresh tasting ice cream with loads of lemon flavor and very little effort. I use my favorite Low Fat Lemon Curd as a base for this recipe. The curd is low in fat because, unlike other lemon curds, it doesn’t use any butter but still delivers a smooth and creamy finished product. I also like the fact that the curd is quite tart, which makes it work very well in this Lemon Curd Ice Cream. The basic method is to make your lemon curd and chill it, then mix it with half and half and a small amount of additional confectioners’ sugar (when served cold, ice cream will taste less sweet than the base alone, so it’s always a good idea to have a little extra sugar). Chill it in an ice cream maker and you’re ready to eat! The finished product is very light and creamy, with a great lemon flavor and a tangy finish. It actually reminds me a lot of lemon sherbert – only better than just about every kind I can remember tasting. You do need an ice cream maker to get the best result. You can make a slightly more granita-like version by pouring your base into a shallow container and putting it in the freezer, then stirring it every 30 minutes with a mixer or a fork until well-frozen. Serve this on its own, with fresh fruit, whipped cream or put a small scoop into a flute and top with champagne for a zesty spring cocktail! Whisk together lemon curd and half and half until well combined. Sift in confectioners’ sugar and whisk until completely incorporated. Pour into an ice cream maker and freeze as directed. Pour ice cream into a freezer-safe container and chill for at least 1-2 hour before serving. In a small sauce pan, over medium heat, combine sugar and lemon juice. Add zest and stir until sugar is dissolved completely. In a medium bowl, lightly beat eggs. Whisking constantly (or with an electric mixer on low), very slowly stream the hot lemon-sugar syrup into the egg. Beat vigorously for 1-2 minutes, then transfer back into the saucepan by pouring the mixture through a sieve. Cook over low heat, stirring constantly, until the curd just comes to a boil. Remove from heat and stir in vanilla. Transfer to a small airtight container and chill in the refrigerator until cold, about 2-3 hours. 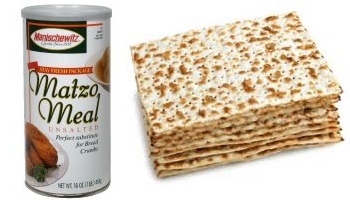 Next PostNext What is matzo meal? This looks excellent! Definitely a flavor to try, lemon curd is so good! Oh yum! I bought myself the ice cream maker attachment for my mixer last year and had so much fun making my own ice cream. 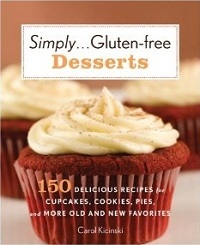 I’ll have to add this recipe to my to-do list. This looks great. I have a question about the confectioner’s sugar in the ice cream. Most confectioner’s sugar contains corn starch. Does that play a role in the ice cream? Or is it used only because it dissolves faster than regular sugar? Thanks, I hope to try this. CHN – It is just used in this recipe because it dissolves easily. Generally, confectioners’ sugar contains only a very, very small percentage of cornstarch and it won’t have any impact on the final recipe whether your sugar has a bit ir is cornstarch free. this looks amazing! i absolutely love lemon ice creams and this one loks so simple to prepare.. will definitely try it 🙂 thanks for sharing! I love ice-cream. I love lemons. I love this recipe! I wonder if using non-fat half and half would negatively affect this recipe? It’s usually what I have on hand and was thinking of using that. Susie Maye – Nonfat half and half is made up primarily of nonfat milk, corn syrup/sugar and artificial flavorings/coloring. The manufacturers typically say that you can use it as a substitute for half and half in sauces and soups, but do not typically recommend using it in something like ice cream, where the texture of the finished produce depends heavily on the presence of fat (less fat means more ice crystals, so you are likely to have a much less creamy and smooth result with nonfat milk or a product like this). That said, if you don’t mind experimenting, give it a shot because it might work out ok. Not having tried the product myself, I would not expect the resulting ice cream to have the exact same texture as the original recipe. You might end up with something more sorbet-like as a finished product. Thanks, Nicole. This is really helpful. I don’t think I want to risk the integrity of the recipe by messing around with nonfat half and half. I am eager to make this icecream but can you please explain to an Aussie what ‘half and half is’? Rhonda – Half and half is a very common product in the US that is half cream and half whole milk, so you can make your own pretty easily! Thanks for your (repeated) reply Nicole,i should have read all your replies from earlier but I was impatient ,having already begun the lemon curd process.Now I’ll make the icacream!